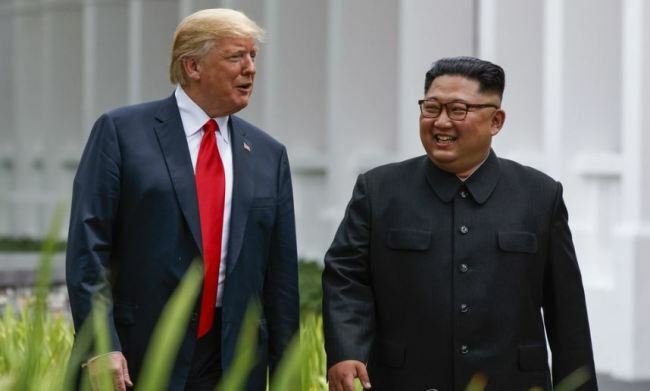 BUENOS AIRES -- US President Donald Trump sees a need to meet with North Korean leader Kim Jong-un at the earliest date possible, a ranking South Korean official said. Trump reaffirmed his commitment to holding the second US-North Korea summit early next year in his talks Friday (Argentine time) with South Korean President Moon Jae-in on the sidelines of the Group of 20 summit. "At the South Korea-US summit, the two leaders agreed on the need to hold the second North Korea-US summit at the earliest date possible," the official told reporters shortly after the meeting. "I believe it will be a great opportunity. I believe it will lead to more progress than the previous meeting." The US president understands the need for a second meeting with Kim to move the North's denuclearization process forward, in that the progress that followed their meeting in June -- the first-ever US-North Korea summit -- far exceeded any made in the decades before, he said while speaking on condition of anonymity. "It appears conditions have changed a lot. It has only been half a year since the North and the US began holding practical dialogue. I believe they will continue to understand each other better and things will continue to improve," the official said. The official noted such rapid changes may have been possible due to what he called a top-down approach led by the US president to denuclearize the Korean Peninsula. "I think the top-down approach is especially working well. Unlike other methods in the past, this is actually solving the problem," he said. The official noted this may be because a summit allows the US president to personally take charge of the issue instead of taking steps designed by his advisers. "Though he may listen to senior officials, President Trump appears to make his own decisions. He has his own beliefs. I believe he is rather leading his advisers," he said.